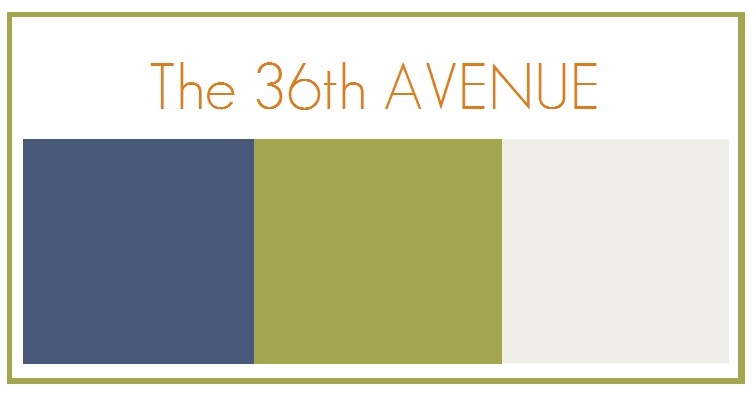 The 36th Avenue Facebook Page. but I am here with a bunch of ideas. Amaifer, I hope you get to see this post and love these nurseries and color combos as much as I do. Every time I am designing a space, any space, the first thing I choose is the color palette. The great thing about designing a room for children is that you can have as much fun as you want. In my opinion there are NO RULES. Bright colors are as welcome as soothing colors, all depends upon your taste and the little one’s personality. Oh BOY… here we go! In Amaifer’s case she is having a baby boy. Seems to me like we live in a world made for girls. It is SO easy to find cute accessories, bedding and clothes for the little divas. to make a special space for your little guys out there. This is a style that is H-h-h-HOT right now. It is simple and clean but at the same time it is bold and whimsical. Here are two color palettes that are similar but with two different accent colors. You can see it in a nursery setting. Here is the second RETRO look. It would be so easy to create this wall art stapling fabric to a canvas. IKEA has a great source of affordable retro-modern fabrics. If you are not crazy about this style you can always choose the classic look. This involves darker tones against neutral walls and it is a safer color combo. Love the stripes and the oversize light features. I would add some orange accents to bring some warmth. The second one has red, navy blue and gray. The third color palette is basically made of strong neutrals with a punch of orange. soft blankets. Here is a nursery using this color combo. Those barn doors are so cool! SOFT NEUTRALS are my favorite ones! These are the colors and look that I chose for my Devin’s nursery when he was a baby. Yesterday I was in church and I saw so many young beautiful mothers expecting. So I thought to throw some girl nurseries out here for the fun of it. I didn’t add as many spaces as I did for the boys. Instead of the classic PINK I chose however to share some less traditional looks for girls. I love this first color combo. Check out the chandelier & the yellow crib. 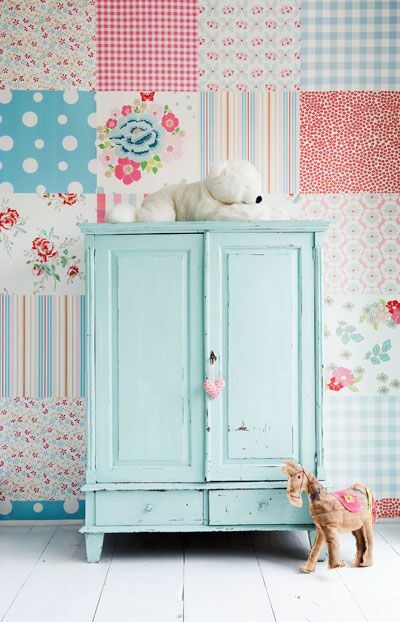 This next color palette and nursery is darling…. I adore the wall treatment and the crib is GORGEOUS! 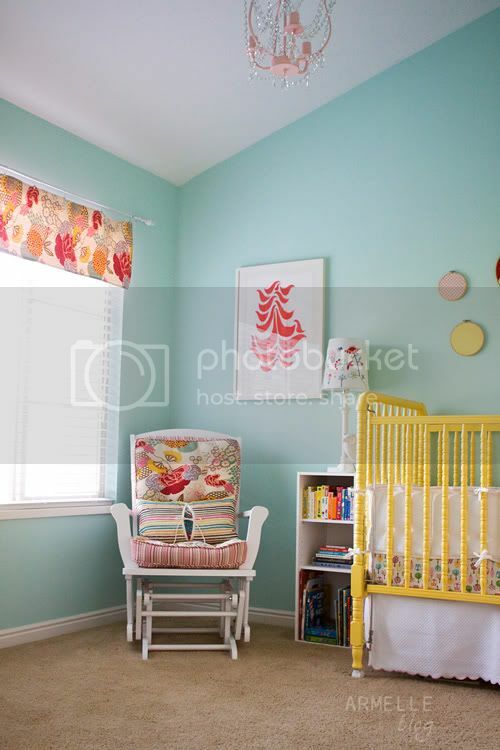 Here is another Nursery using similar color tones but with green accents. I think this could work for a boy as well, just replace the girl touches for boyish ones. From the green down it is all about the boy… from the green UP it is all about the girl. of the pink peach color for the girl bedding and a true dark red for the boy accessories. Make the main color the neutrals: gray and white. Use a true orange and dark teal for the boy accessories. A lighter orange and a clean green aqua for the girl. The yellow can be the accent color. Can you picture bright yellow wooden trucks for him and a bunch of fabulous pompoms for her? Vintage Nursery by Lauren Clark. 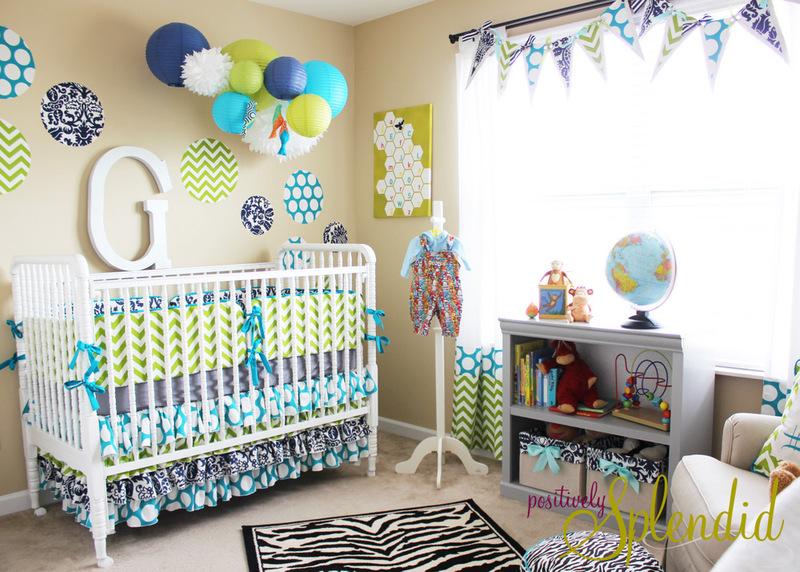 Beautiful Nursery Tour by Positively Splendid. Amaifer, I hope this helps! Love these! I’m doing colors similar to the first girl one, but I don’t want too much pink (does anyone else feel like all the little girl stuff is like pastel pink threw up all over the place?!) So, my main colors are a spring/clover green, light blue, pastel yellow and fuschia-much like the first one. Love that your girl pallets are not too pink! I love your color combinations! You have a brilliant eye to pull from the pictures all of the colors that are working. Thank you for the inspiration! Pinning of course! My son’s room is up for a redo. 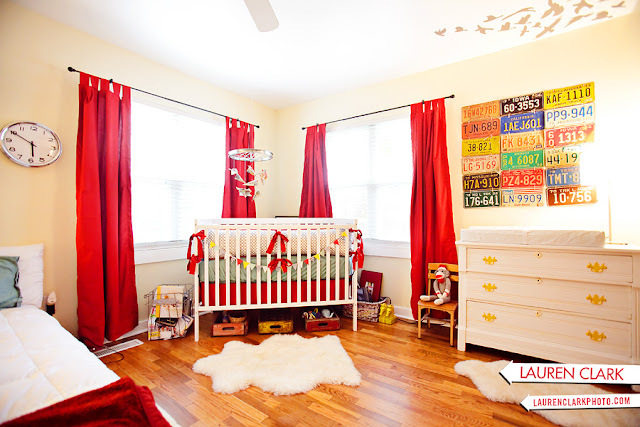 Laybabylay.com also has the cutest style boards for babies rooms. They are to die for. I love the ones with the red curtains – bold and beautiful colors for either a boy or a girl! 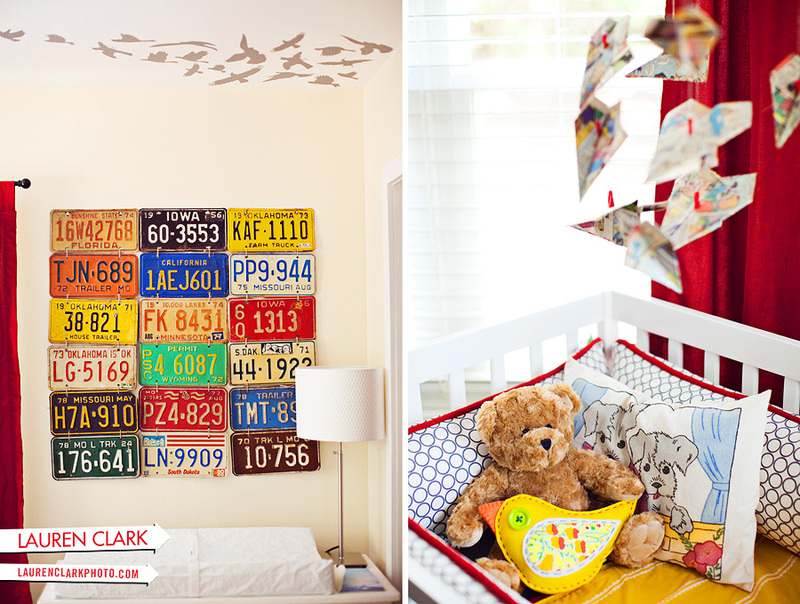 Our boy’s nursery is red and yellow, with lots of other colors thrown in, so if I have a girl next, I won’t have to repaint 🙂 Beautiful pictures, thanks for sharing! Cute ideas! I love the soft neutrals with the large barn-looking door behind the crib! Thanks for sharing!